The Kolstein Ultra Formulation Supreme Rosins are specifically formulated for the cello, offering strong, even adherence, long lasting power, and extremely low powdering. It has an indefinite shelf life made possible by a continual wetting agent in the formula which prevents crystallization, permitting easier application and minimum powdering while playing, and also prevents the cello rosin from drying out with age. Upon analyzing the rosin situation of the modern day violinist, violist, cellist and bassist, it became apparent that the need for a consistent rosin specifically formulated for each instrument was greatly needed. Prior to the development of Kolstein's Formulation Supreme Rosins, rosin was generically made for all instruments with players being forced to use rosins that were not formulated with the individual instrument's requirements. For that matter, the violin, viola, and cello players were using identical cakes of rosin. 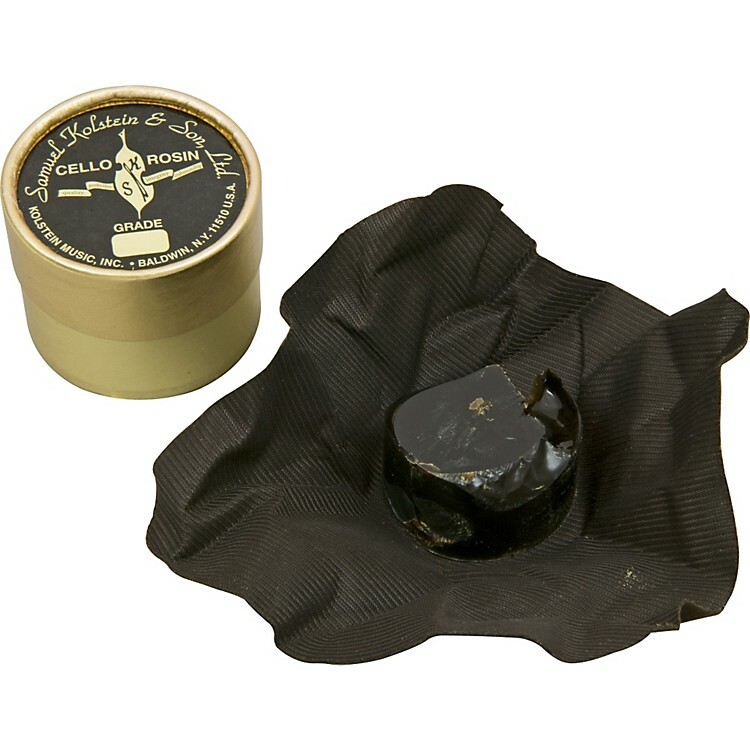 Packaging consists of a lint-proof chamois-like material attached to the rosin cake, with a protective removable cap over the rosin which is inserted into an attractive gold foil container, but practically sized to easily fit in any case or cover. Kolstein's Ultra Formulation Supreme Cello Rosin has truly answered the need of the discriminating player who is striving for a specific formulation of rosin to compliment their bow and instrument, offering strong, even adherence, long lasting power, extremely low powdering combined in a richly textured blend of rosins. With the disappearance of the fine old rosin makers of past years whose rosins were held in high esteem, and the elevated achievements in playing capabilities, there has been a great need to fulfill the requirements of the more discriminating musician. Kolstein's Formulation Supreme Rosin, the result of over forty years of dedicated research and development for the professional players' needs, has recognized this void and is supplying the player with a rosin of greater and more even adherence, longer lasting power and superior packaging. As with all Kolstein's Formulation Supreme Rosin, the musician will attain a rich, tonal quality, unlike other rosins which have a tendency to be gritty and gum up the bow hair in certain geographical and climatic conditions. Custom blending to the requirements of the ultra-professional musician is the key to the success of fine rosin....and the Kolstein Rosin Products have attained this success.